Holistic counsellor, spiritual mentor and discernment coach; shamanic practitioner, energy and sound healer, group facilitator, experiential astrologer, the developer of astroshamanism, AstroshamanicHealing Touch, Astroshamanic Trance Dance, and a large variety of tools for inner growth and transformation. Since 1976 Franco Santoro has worked with thousands of people from all walks of life and countries, offering regular support and guidance in their search for direction, manifestation, life purpose, reconciliation, healing and peace. 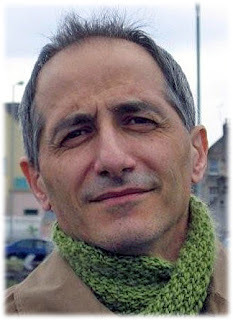 Using his unique holistic skills of facilitation, Franco has been particularly successful in assisting individuals, groups and communities to gain clarity about their highest intentions, developing pragmatic means to fully implement them, while releasing and transforming deep rooted grievances and conflicts. Drawing from a multicultural, non-dogmatic and pluralistic approach to inner growth and spirituality, including consciousness research, expanded states of perception, shamanism, astroshamanism (which he developed since 1976), the Western and Eastern esoteric traditions, his approach also honours and integrates official religions, traditional Christianity, in particular. His work, started in 1976, encompasses the teachings of many traditions, including Christianity, Gnosticism, Hinduism, Buddhism, Sufism, neo-paganism, alchemy, shamanism, Mediterranean and Celtic cultures, A Course in Miracles, Osho (for whom he was press agent as Swami Bodhi Satpathi from 1988 to 1991), the Findhorn Foundation Community and the Provisional Order (his own strategic lineage). He is the author of Astroshamanism: A Journey Into the Inner Universe; Astroshamanism: The Voyage Through the Zodiac; Iniziazione all'astrosciamanesimo, a complete series of sound healing and astroshamanic CDs, more than 1000 articles published online on a large variety of blogs and websites, and other tools for inner growth and transformation. As from 1988 Franco Santoro has run more than 2000 one-week and two-day workshops, in Denmark, England, Finland, Germany, Greece, Holland, India, Ireland, Italy, Scotland, South Africa and Spain. At the Findhorn Foundation Cluny Hill in Northern Scotland, where he lived from March 1999 to March 2013, he held more than 200 one-week residential workshops and around 1000 short events. As part of his ongoing spiritual quest for integrity, in 2013 Franco Santoro left his public work for five months in order to enter into spiritual retreat and discernment. Profoundly enriched by this experience, Franco Santoro has returned to his work, which he intends to pursue in alignment with the spirit of service, healing and transformation that has always characterized his research. As from 23 July 2013 he is again available to offer consultations, workshops and seminars. WE SEEK NEW VENUES FOR OUR PROGRAMMES. Astroshamanism and all of Franco Santoro’s works provided on this website and in general are for the service of mankind. To protect the integrity of this work, Franco Santoro does not permit individuals, groups or organisations to represent, copy, publish, elaborate or employ in any way his work unless they have received a formal agreement signed with his own hand. Requests for permissions can be sent by message, or by e-mail to info@astroshamanism.org indicating the intention and the details of use of any material. Franco Santoro reserves the right to grant, refuse or withdraw permission. Sharing through social media and short quotes are welcomed provided they are properly attributed to the author and source. Franco Santoro releases all direct and indirect responsibilities derived from the use by others of his works, ideas and creations. Please employ any of his material sensibly, without distorting or misusing it. Gaining awareness, understanding and experience of one's unique pre-existing knowledge, talents and potentials, and finding ways to implement them in accordance with one's intention and life purpose. Identifying, developing and manifesting one's intention and life purpose in alignment with the highest consciousness, as you understand this higher consciousness (I call It God). Finding ways to regularly connect with your highest consciousness, allowing it to deeply motivate, transform and enrich your life, for your benefit, as well as the benefit of others and the planet. Bringing dialogue, reconciliation and resolution of conflicts involving few individuals, groups and/or large communities. Integrating spiritual, multidimensional and visionary experiences with everyday life, including family, relationships, creativity and work. Retrieving lost parts of the soul and spirit medicines. Discerning one's vocation and/or making relevant decisions in life. Assisting in devising and applying practices and healing remedies, including a full programme aimed at supporting the above processes. Providing opportunities for further training and refinement of skills, together with the integration of various forms of tuition and short, medium and long term training.